Regularly scheduled art shows and art exhibitions offer the Roatan community and local residents an opportunity to see what island artists are creating. Unique and affordable gifts include a variety of folk art and hand made items that support fair trade organizations and local artisan coops. Most of the beautiful items for sale are made in Honduras and Central America. 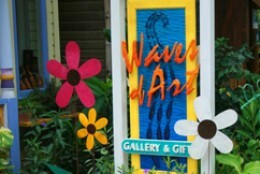 Waves of Art Gallery and Gift Shop offers tourists and cruise shippers an opportunity to find that special gift, support a local artist and shop in an air conditioned space.